April 22, 1969: Robin Knox-Johnston aboard his 32ft yacht Suhaili off Falmouth, England. Donald Crowhurst (at left) faked his positions and tried to fool the world that he won the Golden Globe Race. He ultimately committed suicide. The book A Voyage for Madmen and later a documentary in 2006, depicted Crowhurst’s sad story and now the Oscar-winning actor Colin Firth (at right) will set sail in a biopic. Robin in the tiny cabin of Suhaili enjoying a beer after crossing the finish line. (PPL photo). In March 2006 I found Eric. It could have been the perfect Suhaili replica and was certainly up for the solo voyage around the world with simple modifications. Are you ready? Don announces the 2018 Golden Globe Race, a celebratory 50th anniversary re-enactment of the world’s first solo non-stop circumnavigation race around the world. 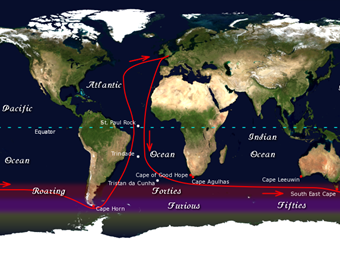 The 2018 Golden Globe race route will follow the same route as the 1968 race, 50 years earlier. In the dark depths of an Antarctic winter, living in a little box chained to rocks with my wife, isolated and alone, enduring constant blizzards, your mind tends to wander. That was my lot in July 1995. I dreamed of many other things during that year of isolation but one idea stuck out above all others. I wanted to build a replica of Suhaili, the 32-foot teak ketch Robin Knox-Johnston sailed solo and nonstop around the world, the first person ever to do so. 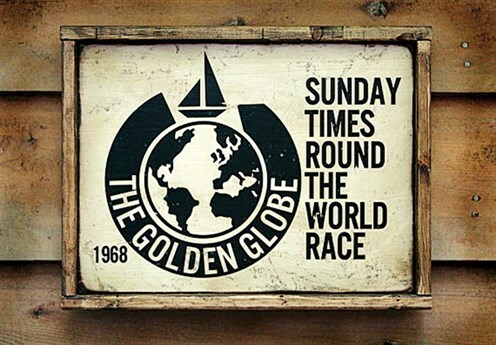 He was the only finisher from nine starters in the 1968 Sunday Times Golden Globe Race. I wanted to recreate that voyage in 1998 for the 30th anniversary of that feat. Dreaming of "what next" is fundamental to my character. If I do decide on something, it is also natural to start planning that adventure while I am in the middle of the current one. Of course many factors come into play to pull these things off but hey, if you’re going to have a go, you gotta start with the dream, right! Returning from the big freeze seven months later, life got in the way and other adventures took over. But the Suhaili idea remained in the back of my mind as a grand adventure. Ten years on, late in 2005 with the 40th anniversary of Robin’s epic voyage looming, I couldn’t stop thinking about it once again. To build a Suhaili replica would cost about $350,000, so I began looking for a William Atkin’s Eric design already built. There were a few in the USA and one in Europe but none in good condition. Unbelievably in Trade-a-Boat six months later, the perfect boat popped up in Adelaide. I was on a plane the next day. It was an absolute glamour; solidly built with real skill by a meticulous owner over half a lifetime. The asking price for Eric was $65,000! Decisions were needed and choices had to be made? At that time in March 2006, I was well into the construction of Ice, my 15.25m steel expedition motorsailer, in China. It still needed another 18 months of my close supervision and passion if it was to become the ship of my dreams. If this idea was to happen, the Suhaili re-enactment would need to start in June 2008, from Falmouth in the UK, right when Ice was due to sail away. First I would need to prepare my Suhaili in Australia, then ship her to the UK, recommission and make final preparation before setting out on a gruelling 10-month solo-circumnavigation. 20 years later and I'm currently entering year five of my treasure hunting expedition Blue Treasure in Tonga. This year should provide some exciting challenges. Time waits for no man and now the 50th anniversary of the Golden Globe Race and Robin’s voyage is looming in 2018. It’s now or never? Last year, during a quiet moment in Tonga, an idea moved to action when I launched the now-cancelled Voyage of Imagination. It was an attempt by me to sponsor two young sailors around the world over two years. I believe there are huge positive benefits that come from encouraging young people to seek out adventure and follow dreams. I did in 1990 when I competed in that year’s BOC Challenge solo around-the-world yacht race, finishing second in my class. Around-the-world yacht races have changed significantly since that first event in 1968. Robin carried no computers, no GPS, no satellite phones or watermakers, and certainly had no shore-side weather routers. He used a kerosene stove and a barograph to face the world alone and caught rainwater to survive. He was at one with the ocean, able to contemplate and absorb all that voyage had to offer. In many ways now, a significant part of the adventure in current around-the-world yacht racing has gone, swallowed up by high tech, while the budgets to compete have become astronomical. Any young sailors aspiring to pitch themselves at the ultimate challenge now have little or no opportunity whatsoever. So in the weeks ahead, I will be announcing my final shot at bringing the Suhaili re-enactment to fruition, with the seeds going back to 1995 in Antarctica. Like all good ideas this one has evolved. I am hoping that young sailors will also pick up this ultimate challenge. A press release will soon advise 2400 global media outlets that a 2018 Golden Globe Race, another "voyage for madmen", is set to take place. It will not be like any other current race around the world and will be accessible to all who have that dream. This anniversary edition of the Golden Globe Race is a celebration of the original winner, the man, his boat and that significant voyage. For the sailors entering this race, using only basic equipment and sailing simple boats will guarantee a satisfying and personal experience. This challenge will be pure, real and very raw, placing the adventure ahead of wining at all costs. Details will be announced in the press release and on the goldengloberace.com website when it opens, but if you have ever dreamt of stepping back in time, pitting yourself against the world's oceans in a simple, safe boat you can afford; your day is coming. Let the adventure begin!